YOU GUYS! If there is one thing I will absolutely miss about Bali (um, let’s be real there will be MANY things) when/if I eventually leave, it’s the TEMPEH! It’s a huge part of the local diet here, and ridiculously affordable — and delicious! One of my favorite ways to get it is cut into tiny pieces (like the size of little fat gum sticks) and fried with a sweet, sticky sauce. It’s crunchy, slightly sweet, flavorful, salty, and packed full of goodness! So: I made it at home. And put it in everything! These tacos actually first came in the form of a salad. I made everything and tossed it together and was like WHOAAA yum — and everybody loved it. Then, duh, I was like “Oooh hey let’s make tacos!” GREAT IDEA! Buying flour tortillas here is my total guilty pleasure. They’re such a reminder of home — and you KNOW I eat flour tortillas en masse at home! So, I wrapped this “salad” up in a taco and called it a day. Yum and yum. I suggest finding the freshest tempeh you possibly can (does somewhere nearby actually MAKE tempeh? find them!). Then, cut it up into little chunks. Fry it in a pan with 1/2″ of oil in it until crispy and golden. Dump the oil, add honey and soy sauce, let it caramelize and coat everything — then you’re done! It’s that easy. Then you’ll just have to try not to eat all the tempe before assembling tacos. TOUGH STUFF, I tell ya! 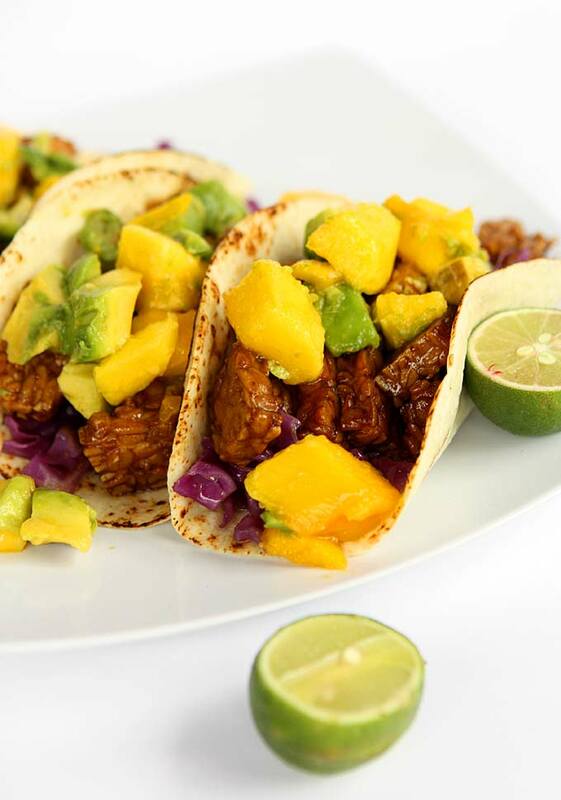 After the tempeh, the star of this (taco)show is MANGO AVOCADO SALSA! I use the word “salsa” very loosely here. 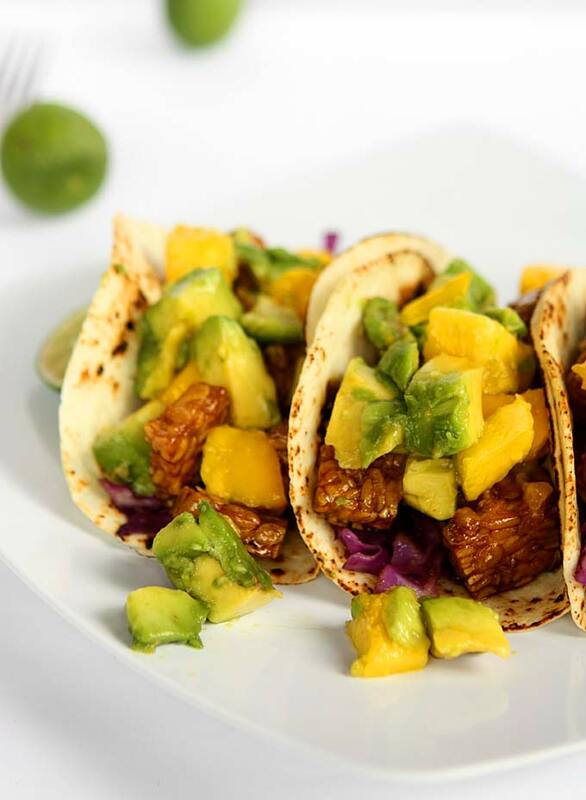 It’s chopped mango and chopped avocado with a squeeze of lime. FANCY (not). But seriously: this is important. They add a punchy fruit flavor, and some smooth creaminess, that goes so well well with the sweet/salty tempeh! If you wanted to add some chopped red or white onion, or even a jalapeño, I wouldn’t stop ya! 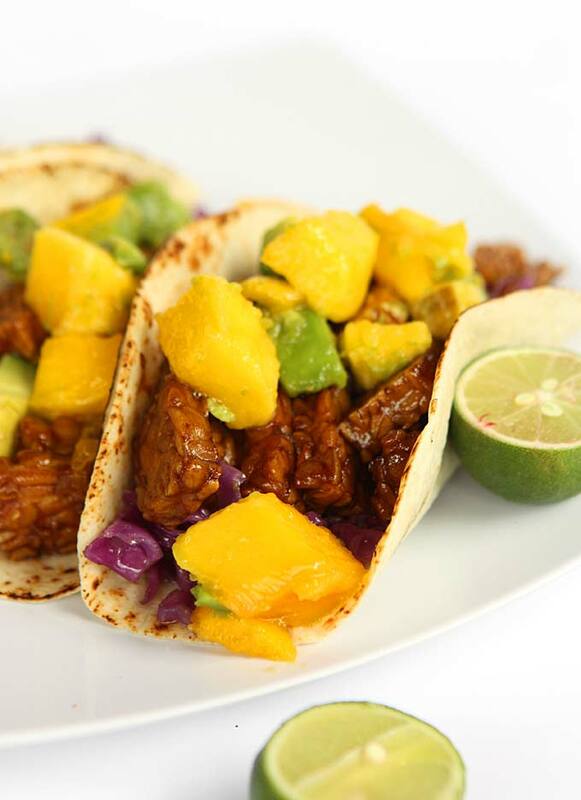 Cube the mangoes and avocados into small pieces, and toss with the juice from two limes. Set aside. Cut the tempe into 1″ by 1/4″ pieces. In a frying pan, heat about 1/2″ of cooking oil until hot. Add the tempe so that all of it is barely submerged. It should sizzle and fry! Fry until golden brown, 4-5 minutes, then dump off the oil (save 1 tsp for later). Return the pan to medium-high heat and add the soy sauce and honey. Mix together and swirl around the pan to coat everything. The sauce will caramelize and reduce to coat all of the tempe. Once it is fully reduced and soaked up, remove from heat. With the saved tsp of oil, cook the chopped cabbage, with the ground cumin, over medium heat for about 3 minutes — you just want to slightly soften it. Remove from heat. 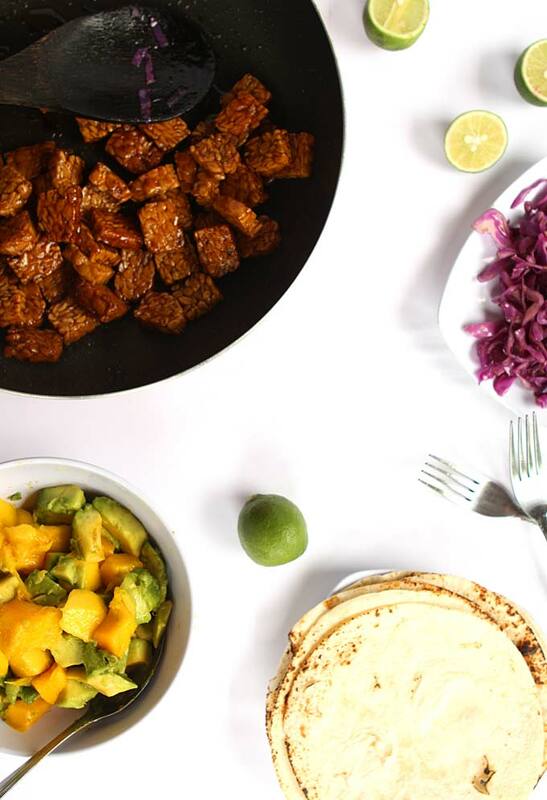 To assemble the tacos, first layer the cabbage, then tempe, then salsa, on a warm flour tortilla. 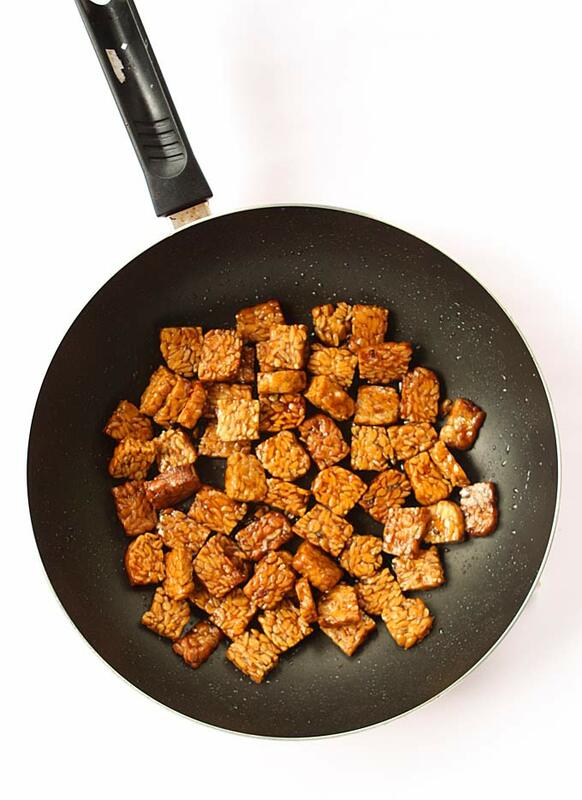 Oh man, I WISH someone around here made fresh tempeh! I’m so jealous. 🙂 These tacos sound amazing! Thanks Eileen! Maybe YOU should make fresh tempeh!! TEMPEH REVOLUTION!